The Heraklion was laid down in late 1939 in answer to the big German, British, American, French, Italian, Russian, cruisers being built at the end of the 1930's as those countries explored the upper limits of the heavy cruiser and into the American designation 'Large' cruiser (CB). Everybody was doing it. However Tyrrhenia surrendered in 1943 with the Heraklion at about 70% complete. 1945 and the Tyrrhenian Admiralty reviews what is left to them after the victorious Allies have been through and grabbed all the best ships and discarded most of the rest. The Heraklion, while an older design, has already had a lot of investment in it and it would serve the Tyrrhenian Fleet for 30-40 years if completed. The original design was reviewed and Tyrrhenia went cap in hand to the US and asked if they could purchase modern tertiary armaments, fire control and Radar to complete the ship. The US agreed and packed up and sent the systems. The new parts from America arrived during 1946 and were incorporated into the new design. Air defence was now one of the major roles of the Heraklion with the automatic 3" and 5"/38cal guns playing the leading roles aboard ship. 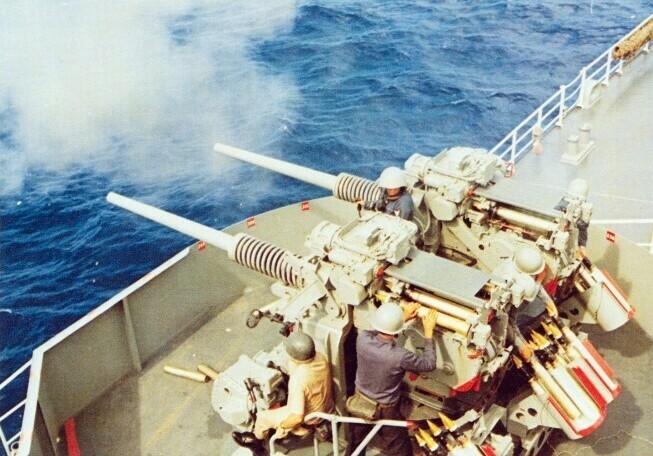 The new 10"/45 calibre guns were an upgraded, upsized version of the 9.2" that were still in service aboard the Syracuse class cruisers. It fired a 580 pound shell, 30,000 yards and was a very good, accurate gun. Only once did the Heraklion get to fire its guns in anger. 1975 and the Heraklion shelled Lebanese dissidents as it covered the withdrawal of non-Lebanese citizens out of the civil war zone. Automatic 3" replaced almost all of the 40mm due to the greater knockdown power of the 3".